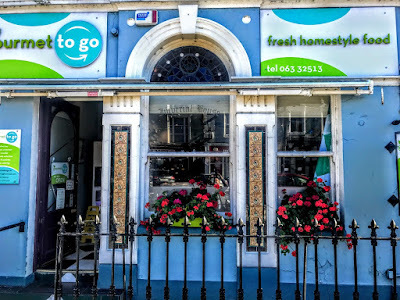 Charleville is a busy market town in North Cork, close to the border of Co Cork and Co Limerick, in the rich farming expanse known as the Golden Vale. The town was founded in 1661 by Roger Boyle, 1st Earl of Orrery and Lord President of Munster, who named Charleville in honour of the newly-restored King Charles II. Charleville, as we see it today, was laid out in a formal plan with two parallel wide streets. 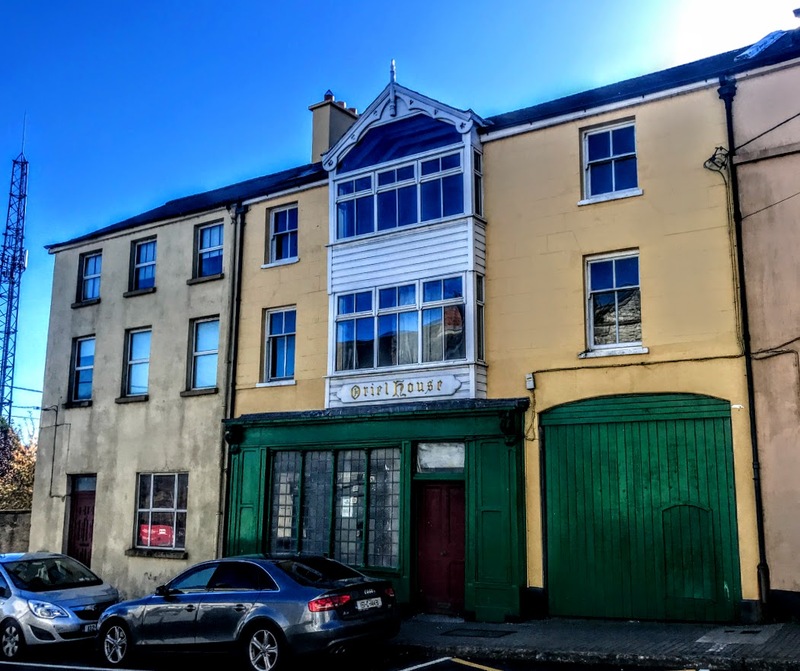 Like most Irish towns, Charleville went through a period of improvements and rebuilding in the late 18th and early 19th century. Most of its elegant streetscapes date from this period, and the town retains much of its historical character in these Georgian and Victorian buildings, including former hotels and shopfronts. 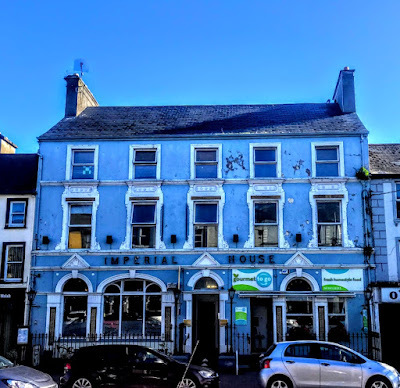 The Imperial House on Main Street, which has been divided into shops and a restaurant, was once a Victorian hotel, known as Madden’s Imperial Hotel and Posting Establishment. 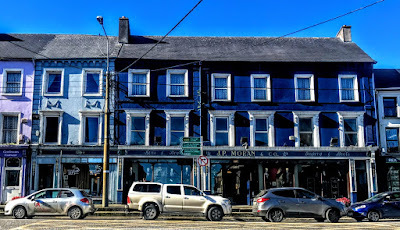 In January 1916, three local Republicans, John O’Dea, Thomas Barry and Laurence Heddevan, were arrested after painting slogans on the walls of Madden’s Imperial Hotel, where a recruiting office was located and members of the Recruiting Committee for Co Cork were staying. 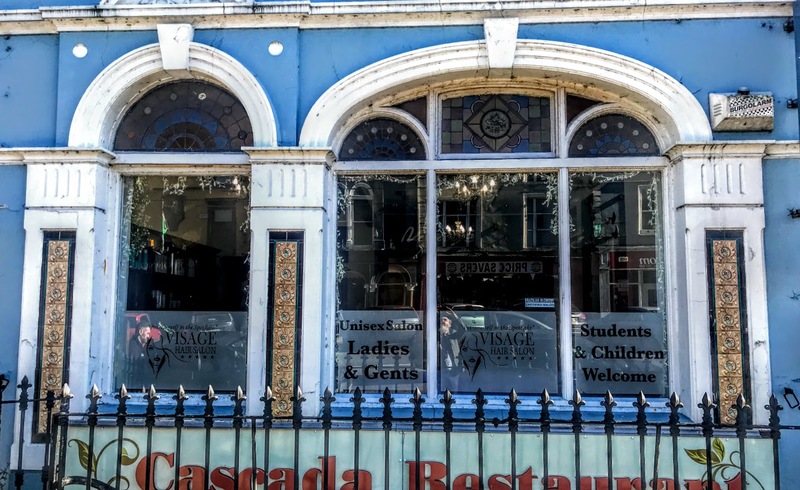 Evidence of the former hotel can be seen in the windows and the highly decorative façade, including the tiled panels and fluted capitals. This building retains much of its mid-19th century character. The use of tiles in the decorations is a feature of the later Victorian period when the production of glazed and encaustic tiles increased dramatically, initiating a new approach to style and decoration. The architectural details of the former hotel include decorative render surrounds, tiled panels over the windows and render cartouches above, flanked by short fluted pilaster details, round and elliptical-headed door and window openings, moulded render cornices including triangular pediment details in the fascia, timber half-glazed double-leaf door, and a keystone. 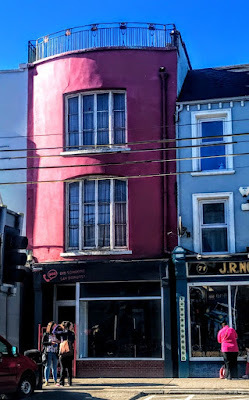 JP Moran’s drapery shop on Main Street, facing onto Chapel Street, is one of the early shop developments in Charleville. This terraced, six-bay, three-storey house and shop was built around 1810 as two buildings, a four-bay building on the right (north) and a two-bay building on the left (south). 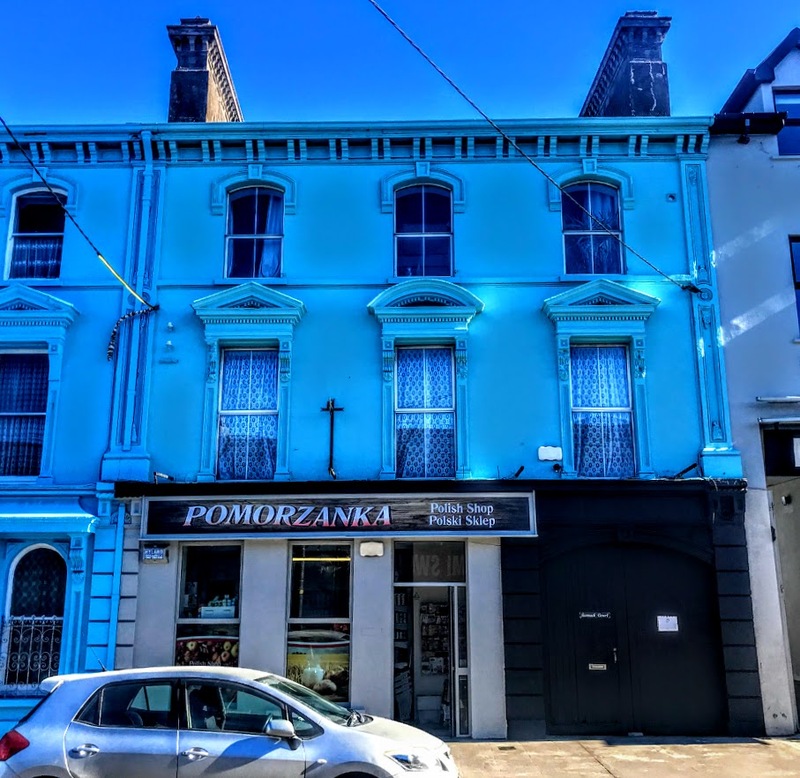 This is a substantial, commercial premises, with a long timber shopfront and render surrounds on the first-floor windows. The shopfront features include mosaic patterns and fine turned, decorative colonettes. The door on the north end are timber panelled doors with overlights. The recessed main shop entrance has timber glazed double-doors. 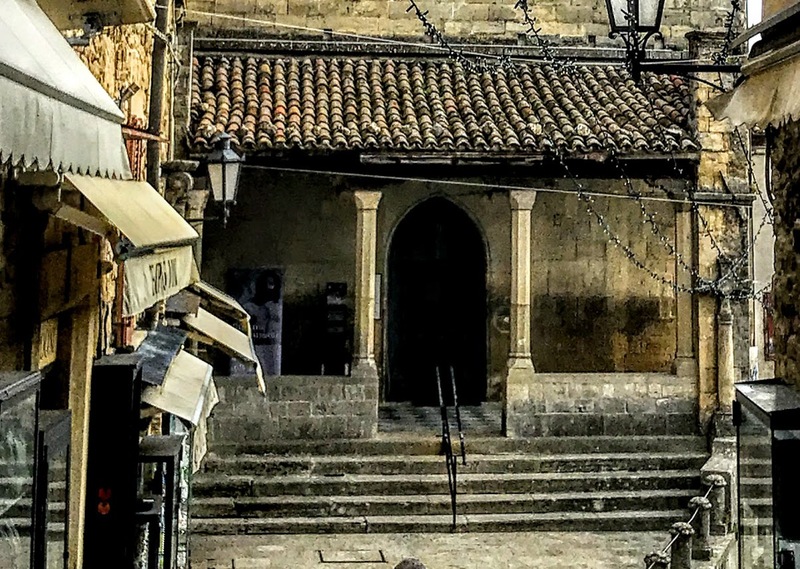 The diminishing windows are typical of the town’s streetscapes and the regular, elegant form is accentuated by the rendered quoins that add further life to the façade. At the other end and on the opposite side of Main Street, a brightly-painted, terraced, three-bay, three-storey house that is now for sale was built around 1880, as pair with the adjoining house. This pair of tall buildings that form an imposing presence on the Main Street of Charleville. The strong decorative plasterwork on the window and door surrounds shows particularly fine Victorian craft work. 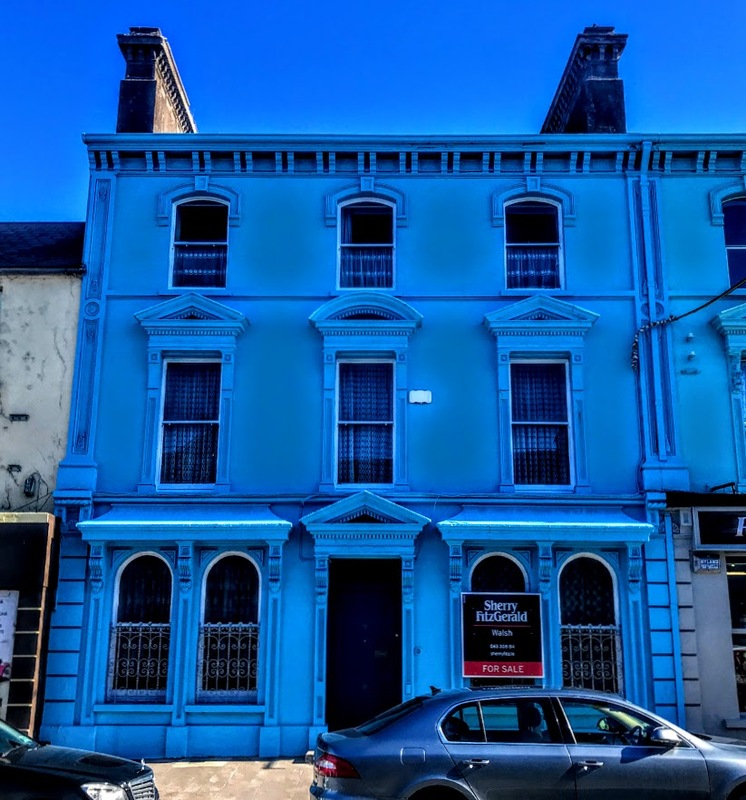 The pilasters and eaves work add to the air of authority of the building, and the ornamental wrought-iron railings at the ground floor windows are a reminder of that until recently Charleville was an important and busy market town. The architectural and decorative features of this house include a central doorway, channelled render pilasters, a decorative recessed panel surmounted by decorative panelled pilasters, timber sliding sash windows, segmental-headed window openings, hood-mouldings with decorative keystones, and decorative render consoles supporting canopies. 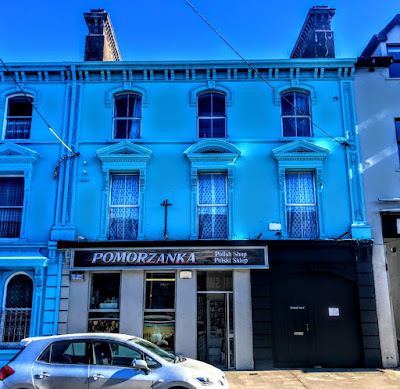 The Polish shop next door was also built around 1880 as a terraced, three-bay, three-storey house, and with an integral carriage arch. Despite the later shopfront, this house still shows fine craft work. The architectural and decorative features of this house include channelled pilasters, a decorative recessed panel, decorative panelled pilasters, limestone window sills, decorative consoles, decorative render hood-mouldings, decorative keystones and stops, and a timber panelled door. The carriage arch is flanked by channelled render pilasters and has a decorative keystone and timber battened doors, with cobbles at the front. I also noticed two interesting, neighbouring houses in Chapel Street during my walk around Charleville last week. 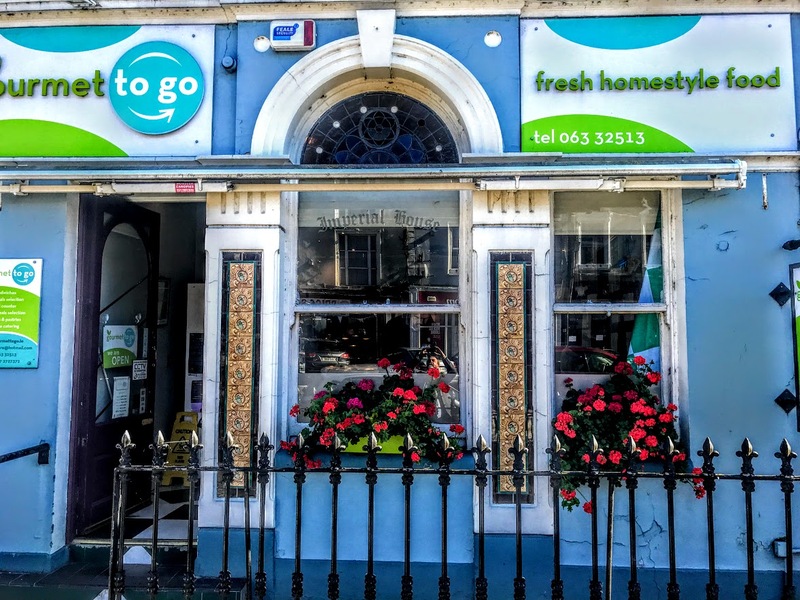 Oriel House on Chapel Street is a late 19th century house and shop, built around 1890, and it has hints of the Tudor Revival style. 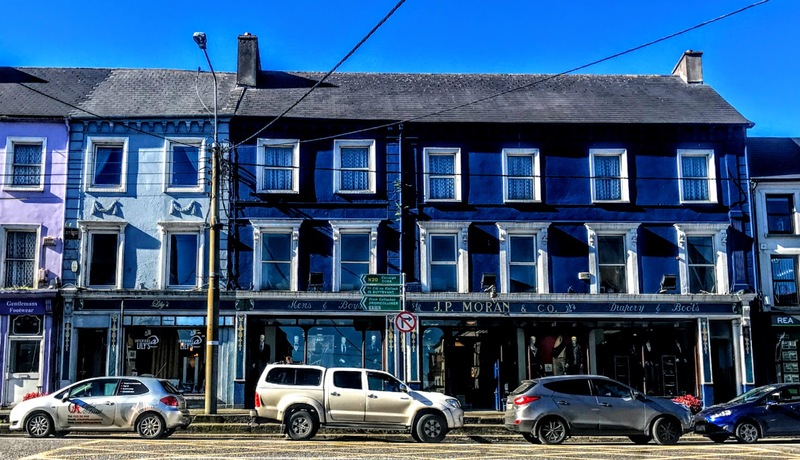 Although Riordan’s shop is no longer here, this remains an impressive building, with a projecting roof line and a former oriel window with distinctive, painted carved timber details. This is a three-bay, three-storey former house and shop, with a gable-front at the projecting first and second floor central bays. At the ground floor, there is a shopfront and a carriage arch that is no longer used. There are decorative timber bargeboards and a finial on the gable-front, square-headed window openings with limestone sills, a carved timber name plaque surmounting a painted timber fascia with a chamfered cornice and decorative timber volutes supported on carved timber pilasters. The square-headed quadripartite display window has painted timber colonettes, and there is leaded glass over the rendered stall-riser. The timber panelled door has an overlight. 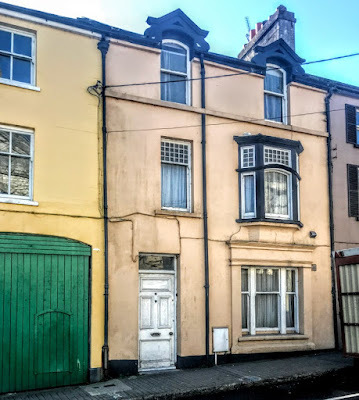 The house next door on Chapel Street was built at the same time, around 1890, as a shop and house and is noticeable for its timber canted oriel window on the first floor. This is a charming building with a number of distinctive stylistic influences in its Arts and Crafts style timber detailing and the polychromatic, multi-paned, timber canted oriel or bay window on the first floor. There are interesting dormer windows above. The former shopfront on the ground floor has a square-headed tripartite window with a moulded render surround and timber sliding sash windows. But by no means is the architectural heritage of Charleville confined to the Victorian and 19th century era. There is an interesting 1950s Post Office on Main Street, and a café on the same side of Main Street has an unusual and eye-catching Art Deco bow front. This tall, narrow, single-bay, three-storey, bow-fronted house was built around 1930, with a shopfront on the ground floor. It makes an interesting contrast with the generally horizontally emphasised buildings on the streets of Charleville, with its bowed front, parapet railings and vertically emphasised windows.